When most people think about steamed food they usually think of boring and tasteless dishes you eat on a diet. But you may be surprised to learn that steaming is one of the three main cooking techniques used in Chinese cuisine. Properly steamed foods and recipes in Chinese cooking are absolutely delicious and full of flavor, as well as being low in fat. Chinese steamed dishes range from appetizers and dim sum to main dishes and desserts. Since steaming is a somewhat simple technique, these recipes are good to try at home. To make these dishes, you can use a food steamer, rice cooker, or bamboo steamer. Many of the appetizers we love to order at our favorite Chinese restaurant are in fact steamed. 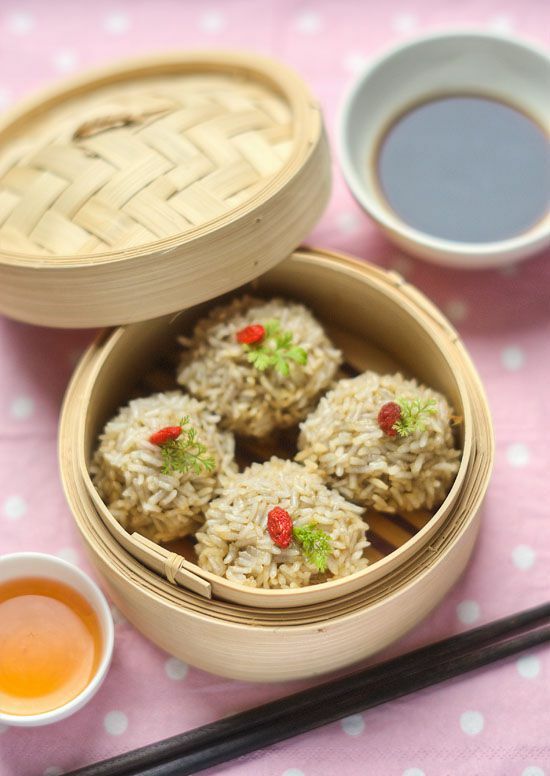 Pearl meatballs, for example, are a classic Chinese banquet and party appetizer; a mixture of meat, mushrooms, dried shrimp, and flavorings are formed into balls, coated in a sticky rice, and then steamed. Fresh watercress helps keep the seasoned meatballs moist during steaming in ngao yuk; the inclusion of dried citrus peel (often tangerine) give this dim sum a special taste. In Cantonese steamed chicken, the Chinese dried shiitake mushrooms add an earthy flavor to this easy-to-make steamed chicken dish. Chicken is marinated in a mixture of soy sauce, rice wine, sesame oil, and reserved dried mushroom soaking liquid and then steamed along with the mushrooms. Lo Mai Gai (Lotus Leaf Wraps: 珍珠雞) is a popular dim sum dish made by steaming lotus leaves that are filled with sticky rice, Chinese sausages, and other vegetables. A very popular dish in dim sum restaurants is Char Siu Bao (Chinese steamed pork buns); these delicate pouches are filled with barbecued pork and steamed until tender. Hua Juan 花捲, or flower rolls, are a very popular variation of steamed buns in the more northern regions of China. Shaped like a delicate Chinese flower, these buns are steamed and then served alongside any of your favorite Chinese dishes, or enjoyed in the morning as a breakfast roll. Dumplings are also a favorite steamed appetizer. Har gow shrimp dumplings (蝦餃) are those tasty shrimp dumplings served at Chinese dim sum with the translucent wrappers. The main trick to making Har Gow is handling the dough, which is very sticky and can break apart easily. Coating the work area and equipment with vegetable oil helps. Shu mai dumplings are a bit easier to make since you don't have to enclose the dumpling; the open top reveals the filling which can be pork and shrimp or prawn and scallops. We may not think of steaming when we look at the many delicious main dishes on a Chinese restaurant menu, but there are actually several recipes to choose from. Fen jen ro is a classic Chinese full-flavor dish that translates into steamed pork belly in rice powder with sweet potato. You just need to plan ahead of time because this dish takes 2 to 3 hours to make. Brown sugar balances the tartness of the lemon in Chinese steamed lemon chicken, a very popular dish. Boneless chicken is marinated and then steamed in a flavorful mixture of lemon juice, sherry, oyster sauce, soy sauce, and brown sugar. Steamed pork with egg custard is a ground pork mixture including soy sauce, sesame oil, cilantro, and ginger that is flatted onto the bottom of a steamer and then topped with beaten eggs and chicken stock; the combination is steamed until cooked and set. A bit more complicated recipe is steamed egg with seafood, which brings shrimp, squid, mushrooms, and edamame together in a smooth egg mixture, all flavored with a delicious sauce. Chinese meals end with something sweet, but whereas American desserts can be quite decadent and created to impress, Chinese recipes are usually lighter, often including fruit. Bananas with cinnamon coconut sauce is a wonderful dish of steamed bananas covered with a combination of coconut milk, cream, and cinnamon. Honey and Chinese dates dress up steamed pears making a simple but tasty dish. One of the most popular Chinese New Year desserts in Chinese and Taiwanese cooking is nian gao, which can be made as red bean sweet nian gao or brown sugar nian gao. Nian gao is made of glutinous rice and symbolizes a profitable year ahead.